Kindred Combination LH UM 20 Ga sink - 20-5/8" X 31-1/2" X 8"
Two bowl undermount 20 gauge sink with small bowl left hand position. Sink features hard wearing satin finished bowls, sparkling mirror finished rim, and included waste fittings. Rear drain positions affords more storage below the counter. Quality assured with the standard Kindred Limited Lifetime warranty. This double bowl undermount sink in brushed satin finish features 20 gauge stainless steel and 18/8 chrome/nickel content. Tight radius corners help maximize bowl capacity. 3-1/2" stainless steel strainers included. 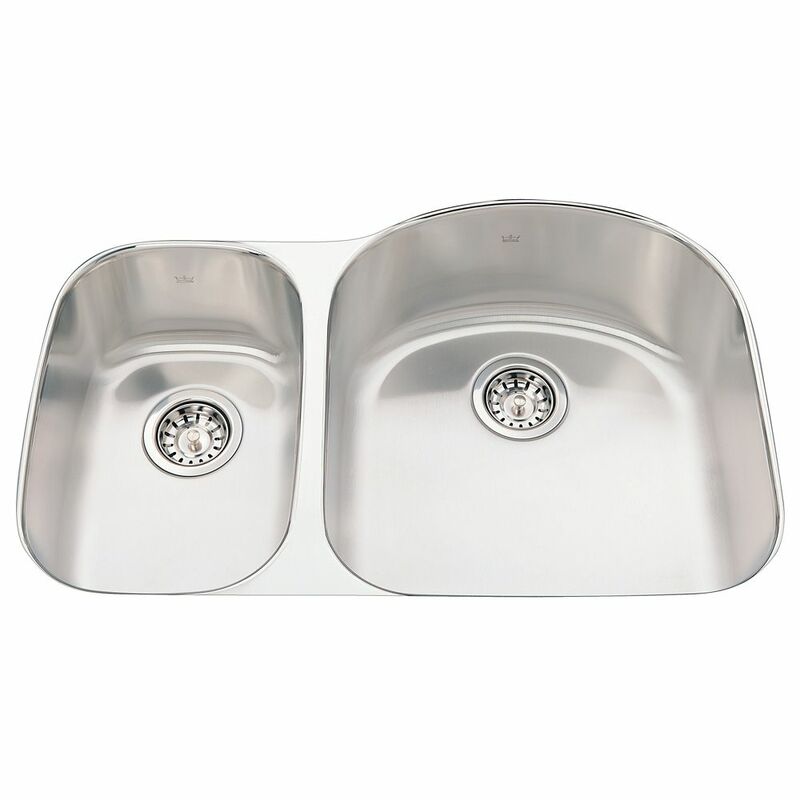 This two-bowl undermount sink features 8-inch bowl depths and is made of 20 gauge stainless steel. The sink includes premium stainless steel strainers. Rear-positioned drain holes offer maximum usable bowl and cabinet storage space. Available in store by Special Order Only. See associate for details. Kindred Combination LH 20 Ga sink 1 hole drilling - 20-9/16" X 27-1/4" X 8"
Combination bowl 20 gauge stainless steel topmount sink. Small bowl, left hand position. Includes faucet ledge with 1 one faucet hole drilling. Rear drains to allow for more storage below, easy care satin finished bowls . Sink is shipped complete with one CA1W colander and waste fittings and is backed with a Limited Lifetime Warranty. Two bowl 20 gauge, top mount laundry/utility sink, small bowl right hand position. Sink features hard working satin finish bowls, a sparkling mirror finish rim, and center drains. Large capacity 12 inch deep main bowl with full sized 7 deep small bowl. Ideal for big clean up jobs and laundry pre-soaking. Backed with the standard Kindred Limited Lifetime warranty. Combination LH UM 20 Ga sink - 20-5/8" X 31-1/2" X 8" Two bowl undermount 20 gauge sink with small bowl left hand position. Sink features hard wearing satin finished bowls, sparkling mirror finished rim, and included waste fittings. Rear drain positions affords more storage below the counter. Quality assured with the standard Kindred Limited Lifetime warranty.